SVMA has nearly 200 volunteers who contribute to the museum in a variety of ways. 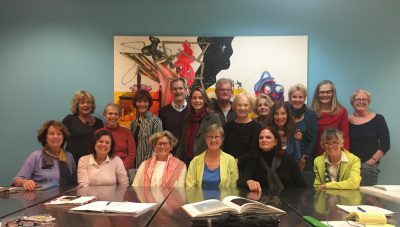 Volunteers welcome visitors, prepare and promote exhibitions, raise funds, and help manage the facility and its activities by serving on the board of directors and advisory council. Opportunities also exist to help with special events throughout the year. SVMA seeks organizational types to assist staff with adminstrative and database tasks and mailings. Event volunteers are essential for SVMA’s exceptional hospitality at exhibition openings, programs, and special events. Volunteers greet and orient guests, assist with event set-up and clean up, food prep and presentation, and bartending, along with occasional specialized duties specific to the event. Event volunteers are the party people! SVMA is always looking for friendly, outgoing volunteers for our front desk. Front Desk Hosts greet and orient visitors, collect admission, track attendance, and monitor the galleries. Museum Guides actively engage visitors with the art and ideas presented by SVMA. They enjoy unique opportunities to interact with exhibiting artists and to learn about art and art history. Guides participate in a special training program, make a two-year commitment to the museum, and receive briefings from exhibiting artists to aid in answering visitor questions. SVMA currently seeks an experienced videographer to record Museum events, public programs, and more. For more information about any of these volunteer opportunities please contact our Visitor Services & Volunteer Coordinator, Kymm Falls, at 707.939.7862 x10 or kfalls@svma.org.